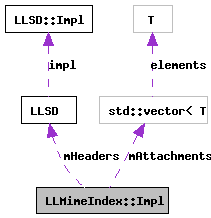 Implementation details of the mime index class. Definition at line 92 of file llmime.cpp. Definition at line 105 of file llmime.cpp. Definition at line 95 of file llmime.cpp. Definition at line 97 of file llmime.cpp. Definition at line 106 of file llmime.cpp. Referenced by LLMimeIndex::attachSubPart(), LLMimeIndex::subPart(), and LLMimeIndex::subPartCount(). Definition at line 101 of file llmime.cpp. Referenced by LLMimeIndex::contentLength(), LLMimeIndex::contentType(), LLMimeIndex::headers(), and LLMimeIndex::isMultipart(). Definition at line 102 of file llmime.cpp. Definition at line 103 of file llmime.cpp. Referenced by LLMimeIndex::LLMimeIndex(), LLMimeIndex::operator=(), and LLMimeIndex::~LLMimeIndex().